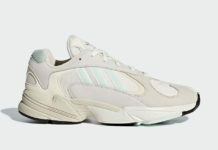 adidas has revamped the classic Falcon Dorf from 1997 to introduce their newest silhouette, the adidas Yung-1. Look for the adidas Yung-1 “Hi-Res Orange” to release on June 20th at select adidas Originals retailers and adidas.com. The retail price tag is set at $130 USD.